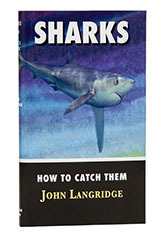 Just when you thought you had finally hunted down the very last one of the How to Catch Them series, John Langridge has gone and come up with another one. He has already contributed a book about catfish and now we have a follow up volume on sharks. Anglers of a certain era will recall the How to Catch Thems as a classic series published by Herbert Jenkins in the sixties. They made the ideal present for a fishing crazy nephew and hundreds, if not thousands of young fishermen must have been sucked into the sport after one or another of the series turned up in a Christmas stocking. Plenty of older anglers read 'em too, because you could more or less guarantee that if a book was in the series, it was written by an expert on the topic and it would give a pretty good run down on what to do - if you bought one and followed the advice, you caught stuff. The books were all pocket-sized and this new addition to the series, published by the Medlar Press matches the originals down to the last detail, so it makes a great addition to the set. The author follows the original format, introducing the different species likely to be caught in UK waters, before going on to describe tackle and methods and then finishes with a section on conservation. The latter is a new departure for the series, the originals being written in the time before far eastern fishing boats began the senseless slaughter that has reduced many, if not most, shark populations to unsustainable levels and is still dumping live fish into the sea shorn of their fins. If you want to be a sustainable shark fisherman, this is the way to go - a great introduction to the subject.